« I’m judging at the Jharvest (Jewish CSA) launch party potluck tomorrow w/ Oxbow Farm. Please come! Many years ago, my friend Karyn was in my kitchen. This was shortly after Passover. 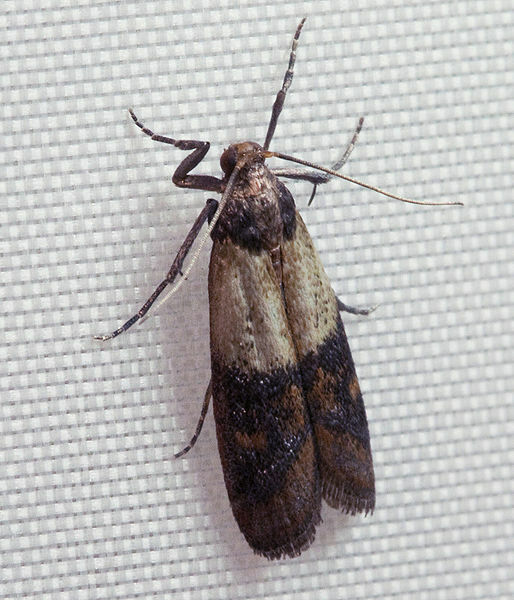 She looked up at my cabinet, where lurked what I thought was an innocuous-looking little brownish-grey, narrow-winged moth, and said, “That’s a kitchen moth. They’re going to infest all your grains. This sounded implausible, and I made a joke about how it sounded like a plague of punishment for not following the rules of Passover fully, since I’m not really religious. Strict observation of Passover involves getting rid of or sequestering/selling all your grains, as well as not eating grains. Kitchen moths also sounded a bit like the locusts and lice and frogs and cattle disease we refer to when we recite the Ten Plagues at Passover. Then, a few weeks later, I picked up a bag of quinoa in the cabinet to discover it had tiny little holes in it, a dusty, tan substance at the bottom, some webbing, little moth eggs that looked disturbingly like quinoa, as well as some (ew) little larvae and dead moths. Turns out the kitchen moths were in everything, and Karyn was right. You may never have had kitchen moths, or you may have faced them over and over again. They’re hard to get rid of and very common in the Pacific Northwest. They can squeeze down the spiraled rings of tightly-closed glass jars that aren’t heat sealed, can bore into hard plastic containers (to say nothing of plastic packaging or bags), and could probably unlock and drive away your car if they were big enough. They live not just in grains and flours, but in dried fruit, some spices, chocolate, pastas, and whatever else suits their fancy. I don’t eat a lot of grains, but I do keep rices and beans pretty well stocked, as well as gluten free flours. I try to be vigilant about kitchen moths, but I still see a few sometimes, and go through steps to get rid of them. 1. Search every food container in which they could possibly live, even if it’s made of glass. Search flours, grains, dried fruit, spices, pastas, chocolate, nuts (the moths just attacked my almonds!) and all your pantry storage other than metal cans or heat-sealed jars, really. If you see any trace of the moths (look for the dust that looks like sawdust near the bottom, larvae, webbing, and dead moths), throw the item out and take the garbage out immediately. If you don’t see moth residue, set the item aside. 2. Freeze everything you’re not throwing out for 24-48 hours. You can do this in batches if necessary while cleaning, but consider storing in the refrigerator the stuff that’s waiting for its turn in the freezer. 3. Clean everything. Take shelves out of cabinets and wipe the edges; moths like to hide their eggs in hard-to-get-to places. Clean your kitchen ceiling if you see any webbing or moth larvae. Focus especially on any cabinet or drawer that has held food. 4. Kill or remove every single kitchen moth you see. NOTE: As a preventative measure, you can freeze any grains or flours when you bring them home from the store. I don’t use a lot of grains, but I keep a pretty good supply of things like rice and lentils around, and I have my bag of gluten-free flours. I store those all in the freezer in one big bag, because they’re expensive and it would be disheartening to have to throw them all away. I will add that grains aren’t the best foods for us, particularly when not treated with soaking/sprouting/fermenting. Maybe the moths are trying to tell us something. Thank you for the info. I noticed them recently and now just had to throw out 3 shelves of grains, beans and such. I will now be keeping those types of food in the freezer as well. You should also check the food when you buy it at the supermarket. I’ve heard some horror stories of homes getting infected because of this!